... on a seedpod adventure. At the end of the market last weekend, my stall neighbour Brenda gave me a seedpod that had been part of her table decoration. 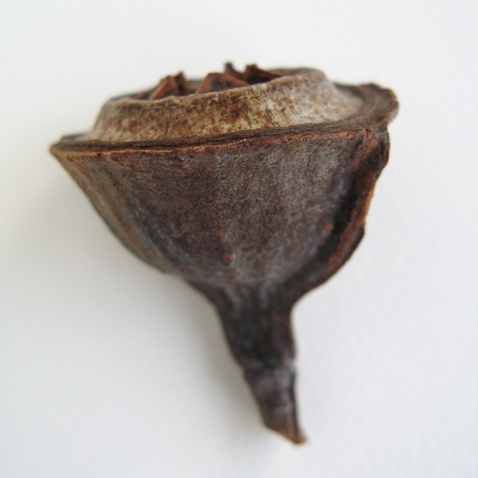 I had noticed it earlier, and we'd talked about how it was most likely the 'nut' version of the same macrocarpa eucalyptus that I used (in bud form) for my most recent seedpod wall hanging. When we were packing up she gave it to me. 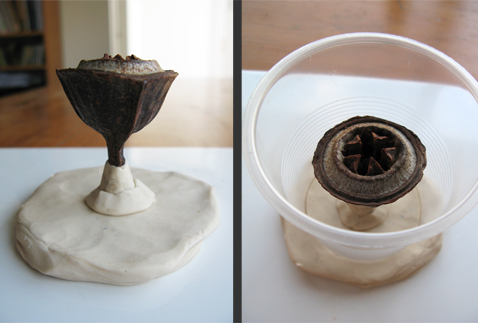 We had both wondered whether I would be able to make a mould from it. It had some fairly deep openings, but Pinkysil is very forgiving and I thought it might just work. It did work... that is, until it didn't any more. Pinkysil IS very forgiving but it can only handle being stretched to billy-oh for so long. 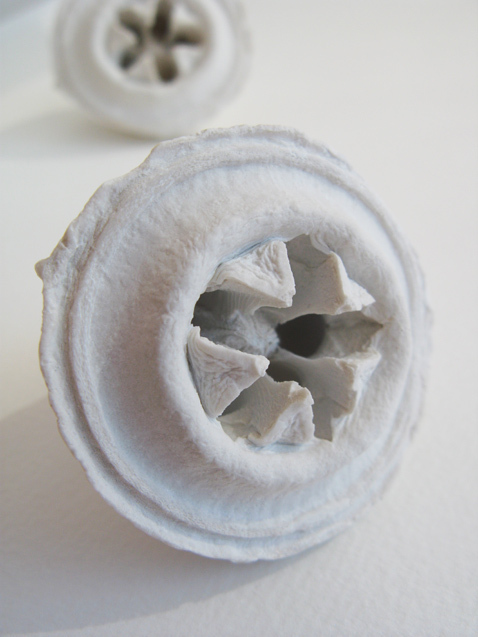 Even though I cut down through both sides of the mould to gain access, the interior voids of the nut were quite intricate, and extricating the plaster cast required some degree of force. After only a couple of casts, pop! Still, I did manage to get three decent casts from it before it busted. Never mind.. this is one of the perils of mould making. Sometimes you make it one way only to realise it would have worked better another way. For example, this one would probably work better as a two-part mould, but even so, interior spaces are difficult to deal with, and it still might not have worked. ... on filling a whole table. Now that it's all over and I've had a good sleep, I can start to speculate upon how much I've enjoyed the past few weeks of preparing for my first whole-trestle-table market, the BrisStyle Indie Market in Brisbane City Hall, which was yesterday. What a wonderful venue for a market! The whole of City Hall has just been so beautifully renovated, it was a real delight to be there. The individual stall areas were spacious and there was plenty of room for shoppers - I give the venue three big thumbs up! For me, a whole trestle table seemed like an awfully large amount of space, but to make transport and unpacking easier I'd set myself a limitation of 'all these things need to fit onto one fridge trolley', which after a bit of nifty origami-like display item packing, was indeed achieved. I had so much fun scouting about for items to use for my display. My main criteria was 'recycle'! I really wanted something to be able to put my wall hangings in to show them off properly - they're so airy that in the past, hanging out in the open, I think they've been a bit lost amongst the riot of colour and texture that is a handmade market. 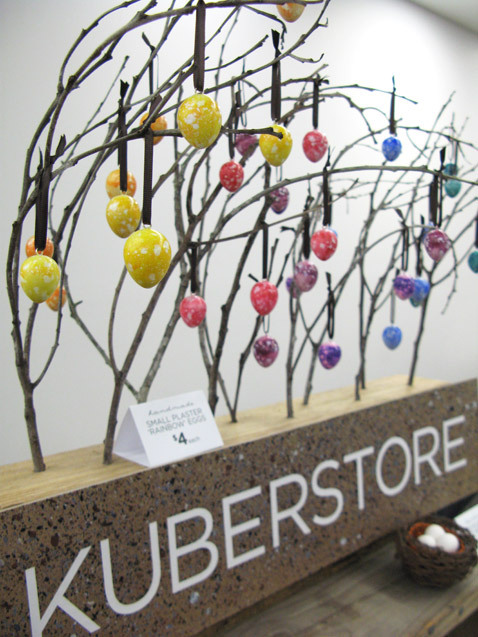 An old beehive box with a white paper backing insert was just the ticket, and it gave me somewhere high to put my big Kuberstore sign, and a spot for a little twiggy wattle forest to hang my little rainbow eggs. C (oh thankyou for helping me, you splendid man) made me a box and a display stand out of some plywood that I'd been keeping because I knew it would come in handy. It was the shipping crate that my lovely Bellerby globe came all the way from London in, and I'm very happy that some of it now has a new life as part of my display! 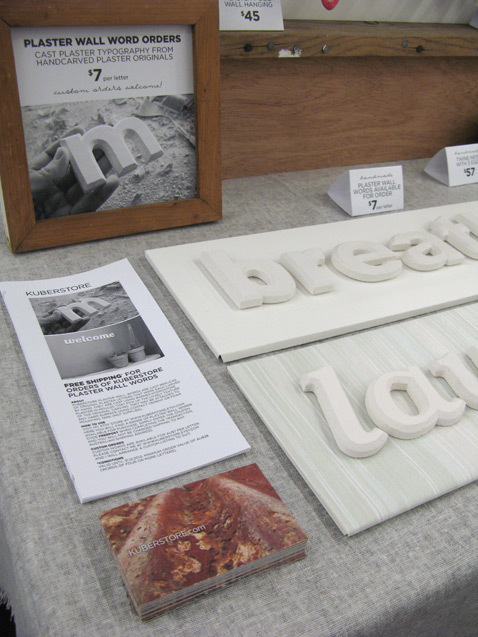 It was a bit tricky to present my plaster wall words, as I didn't want to have lots of stock there, and most online orders are custom words these days. So, I had a couple of display words (including the ever-popular 'laundry') and some take-away brochures explaining the pricing and so on, and a 'free shipping' coupon code that customers can use in my Etsy store. Etsy store coupon code: enter the coupon code freepost during the transaction for free Australian shipping on orders of plaster wall words of four letters or more (AU$28). Valid until 31.12.2013. Hooray! 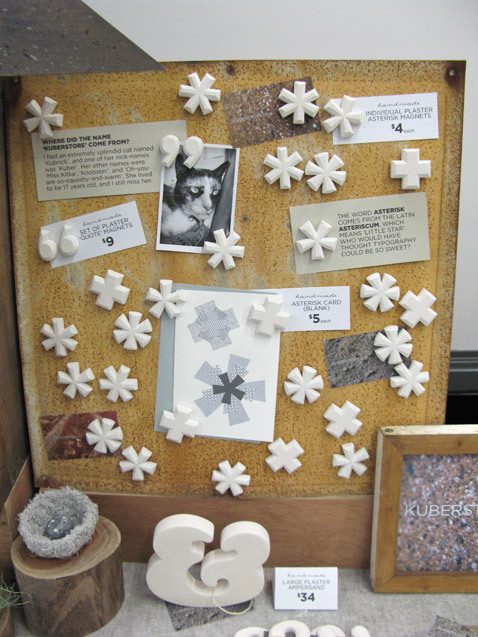 My rusty old sign was just perfect for showing up the whiteness of the cast plaster asterisks and quote mark magnets, and gave me a place to stick some snippets of info and one of my new asterisk envelope-pattern cards. And the day itself? After the crazy whirlwind of preparation and the anxiousness of 'Am I ready? Is everything packed? 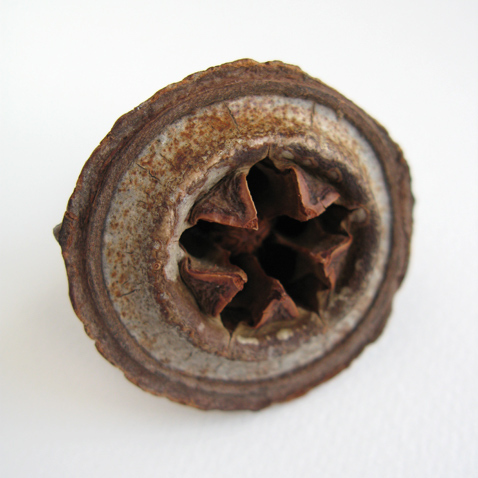 ', the worst thing that happened was a momentary panic at having to get the fridge trolley up a curiously-high pair of stone steps at the Ann Street entrance to City Hall, and a dropped shoebox that saw plaster asterisks and eggs spilling out onto the floor which, thankfully, was carpeted. The best things? My stall neighbours Clare (who makes beautiful silver jewellery) and Brenda (an artist, embroiderer and fellow seedpod-admirer) were cheery and lovely to meet. My Ma came for a few hours, bearing coffee (thanks Ma, so much!) and so I was able to check out the rest of the market and have a good chat with Bronwen from Whizzbangle/BravoJulietDesigns about the joys and perils of making moulds from Pinkysil. I had set up a little spot to carve at the end of my table, so I spent most of the day happily carving plaster and chatting to people who stopped by. A satisfying number of little Kuberstore parcels went off out into the world. So. 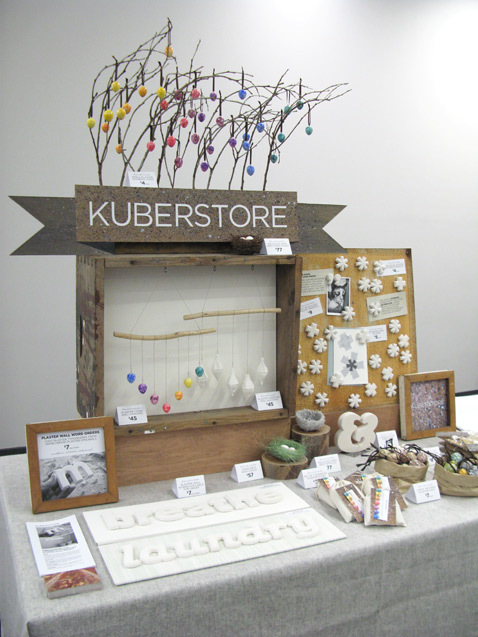 I loved the venue, and I much prefer a daytime market over the evening ones I'd previously done. I think I'm already looking forward to the next one, but first? Pancakes for breakfast, and then... unpack! I received the most wonderful list of questions about Kuberstore the other day, and what I liked about them was that many were tailored to be quite specific queries. It made them so easy to answer! 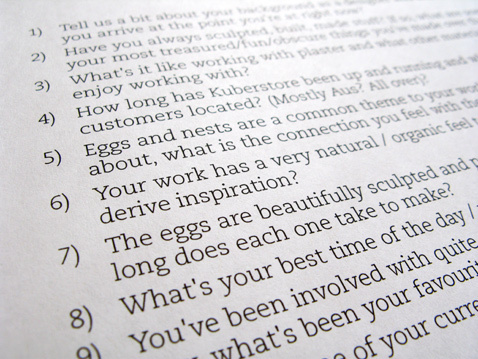 I used to work with Lisa, and when she contacted me recently about whether she could feature me on her lovely design blog, I was delighted, and even more so when I saw her list of questions. You can find all the answers at lisaherse.com, as well as lots of other nice things by Australian creatives that Lisa has found. She is an excellent designer herself, and you can find some of her work there too. Thanks heaps, Lisa!